I can’t wait to see Prometheus and plan to do so as soon as possible next week. That’s about it. Changing Lanes (mixed bag): This 2002 thriller about the less-than-calm reactions by two men involved in a car accident isn’t terribly memorable, and features decent but unspectacular performances from Ben Affleck and Samuel L. Jackson. It’s very missable. Chasing Amy (mixed bag): This Ben Affleck film from Kevin Smith is a staple of the 1990s, featuring a Golden Globe-nominated lead performance from the soft-spoken Joey Lauren Adams. I don’t have much to say about it other than that it’s an intriguing film not quite made for me. Darfur Now (mixed bag): Before Don Cheadle played a slimy management consultant on “House of Lies,” he was the star of this so-so 2007 documentary, which aimed to be a call to action but wasn’t nearly as on-message or focused as it hoped to be. 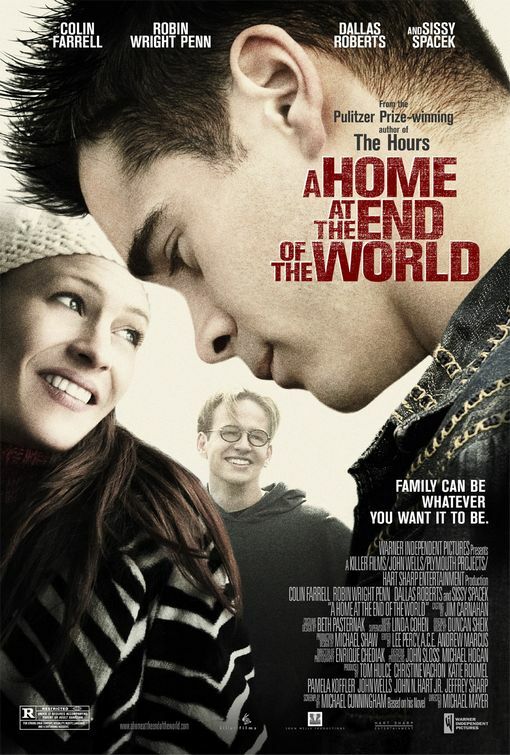 A Home at the End of the World (recommendation): This little-seen 2004 drama was one of the first films I ever reviewed, based on a Michael Cunningham novel and telling an intriguing love triangle tale with strong performances from Colin Farrell, Dallas Roberts, Robin Wright, and Sissy Spacek. Lbs. (anti-recommended): I did not like this story of an overweight man whose life is ruled by his weight, presenting a sad sack premise without many memorable moments. Its protagonist’s journey is only mildly inspiring, and the film never manages to be interesting enough to be sustainable. Paradise Now (mixed bag): This controversial 2005 Oscar nominee, billed as coming from Palestine, tells the story of two suicide bombers. Its unsettling premise is inarguably intriguing, but the film isn’t without its problems. The Pianist (highly recommended): This 2002 Best Picture nominee won very deserved Oscars for its direction, writing, and lead acting by Adrien Brody in the performance of a lifetime as a pianist kept alive by his musical talents in the Warsaw ghetto during the Holocaust. Extremely disturbing but well worth it. The Ten (mixed bag): This series of vignettes was David Wain’s follow-up to “Wet Hot American Summer” before he made the far superior “Role Models.” Entertaining at times, this film is all over the place, and some segments prove much funnier than others. Toast (anti-recommended): This food movie is highly appetizing and looks pretty good, but its story suffers profoundly from a lack of depth, presenting mouth-watering recipes from failing to create compelling characters.